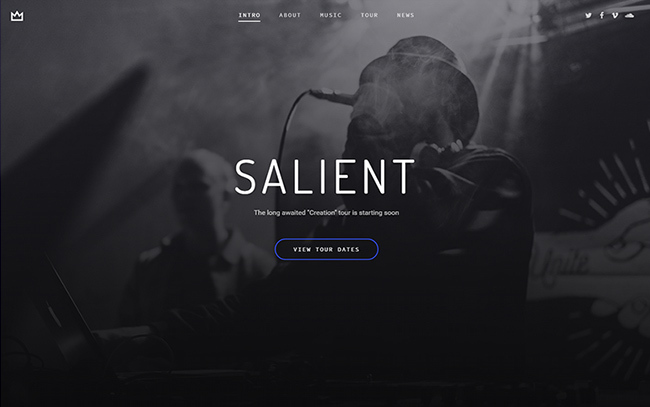 Salient provides ton of styling options & advanced functionality for our portfolio post type. Display your projects in a variety of ways, suitable for nearly any use case. Control masonry sizing per project, column sizing, project coloring, filtering & much more! All of the following project styles can be displayed in your choice of portfolio grid layout with custom sizing & coloring. Designed to make big statement. Salient Band is perfect for showing off your band to the world. A single page design with tour dates, music streaming, blog and more.